Europe is a melting pot of fashion. And fashion is thrives on out-of-the-box concepts. The streets of Madrid are no different. Forward-thinking fashion is the name of the game and the fashion-conscious youth on the street is continuously on the lookout for something trendy to wear. Turning heads is the aim of the game for designer Ruben Galarreta. And his newest offering, the Cropped Black hoodie is no different. Casual yet trendy, familiar yet unique, is how the Black Cropped Hoodie should feel when you take it out of your wardrobe and wear it. The Black Cropped Hoodie from Ruben Galarreta features a cropped tummy that allows only half your torso to be covered. For those on the lean, muscle side, this can be an incentive to flaunt more of your toned physique. 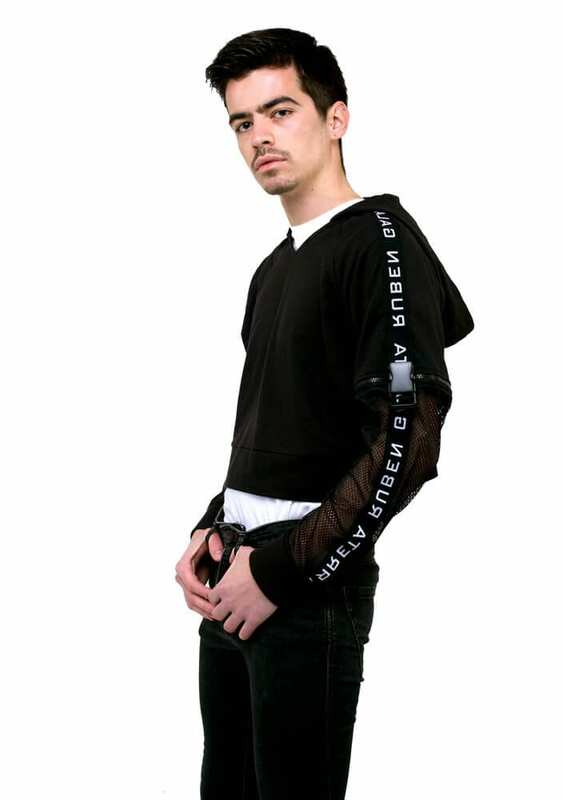 The meshed sleeves also lend the hoodie a neo-futuristic feel that does not have to strive too hard for attention in public. The uniqueness of the hoodie is also contributed to, by the stretchable quality of the fabric. The logos roll down over the meshes of your sleeve, giving a good glimpse at the name behind the design. The hoodie is also armed with smooth running zippers and clasps that help you adjust the dimensions as per your convenience. The clasps help you remove the mesh-half of the sleeves allowing you to wear it without them. This makes for a secondary fashion statement from the same Black Cropped Hoodie. If you are feeling experimental, then simply leaving the mesh-sleeves clasped but not chained is another way to play on the garment. 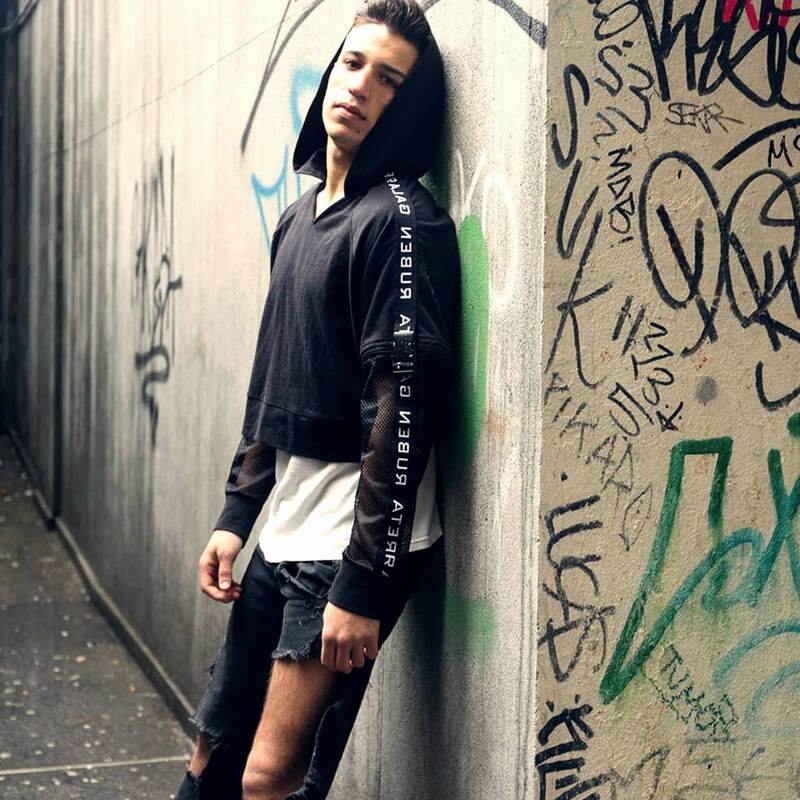 A prime example of the layered sense of fashion design that we have come to witness from Ruben Galarreta so far, the Black Cropped Hoodie is made of 100% premium cotton that further maximizes the comfort factor. 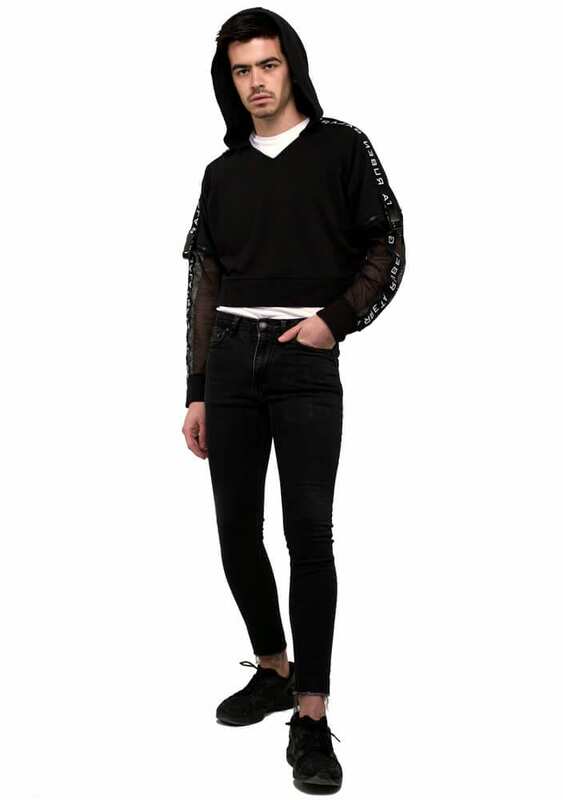 Don the Black Cropped Hoodie, be the mysterious ‘fashionista’ strutting down the lanes of Madrid today!